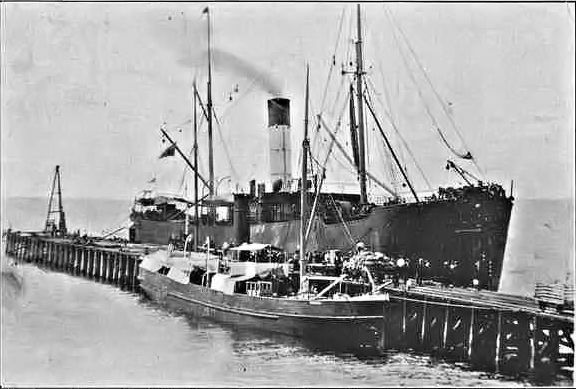 An inquest on the body of Charles Barry, late steward of the steamer Warooka, was held on April 6 and 7 at the Troubridge Hotel at Edithburgh. W. V. Cornish acted as coroner. W. W. Cotterell gave evidence of identification. Had known deceased for 20 years, and considered him a sober man. Last saw deceased alive at midnight, when he left the hotel to go aboard the Warooka. The night was very dark and squally. Considered the state of the jetty a man-trap for anyone having business on it after dark. There was no light generally to guide anyone. There was no boat at the jetty to help in saving life. William H. Dare also gave evidence of identification, having recognised the body by the shape of the skull. The witness, who is barman at the Troubridge Hotel, deposed that when deceased left he was perfectly sober. Alfred Byrne deposed as to the finding of the body on the Coobowie beach, three miles from Edithburgh. George Philpot Morris, corporal of police, said he took charge of the body and removed it to the police-station, Edith burgh. The body was much mutilated by fish. On the right hand side of the skull above the eye there was a red mark like a stain, which may have been a bruise. Found a watch and chain in one of the pockets, and afterwards took a gold soli- taire from the shirt. The trousers of de ceased were gone. Edward Lee Bartlett, master of the Warooka, said he was ashore on the night of March 31. Saw deceased in the Troubridge Hotel between 11 and 12 p.m. Then left to go on board. The night was dark, and it was blowing hard. Had no difficulty in getting on board, but it was certainly dangerous, as the jetty was terribly limbered. Did not go to bed till 12.30 am. Heard no one else come on board. The ship was 6 or 7 ft. from the jetty. There was no room for a gangway, as the jetty was lumbered up with salt, railway iron, and pile driving machinery up to within a foot or 18 in. of the edge of the whole length of the vessel and beyond. Left instructions for a light to be exhibited. The wind blew out the light. Deceased's hat was found on deck the next morning. Did not consider deceased tried to set on board, as he was of a very nervous disposition. Could not say who was responsible for the lumbering up of the jetty. Believed death to be accidental. Joseph Harris, able seaman, was on board working on the night of March 31. It was terribly dark and windy. The state of the jetty was dangerous to life owing to the salt stacked there, and the amount of iron and machinery littered about. Could not say whether lights on the steamer and jetty were burning when he went to bed. Deceased was a very nervous man. Alice Barry, widow of deceased, identified the watch and chain and solitaire as those belonging to her late husband. Deceased was 39 years of age, and was not subject to fits. John Charles Barry, chief officer of the Warooka, corroborated the evidence as to the state of the jetty, and said that he left lights burning on the steamer and jetty when he left off work at 11 p.m. The jury, after a short retirement, brought in a verdict "that deceased came to his death by drowning", and added the following rider:-"We think that the steamer Warooka should have better appliances for the crew to go to and from the vessel at night; also that the jetty authorities be severely censured for the state the jetty is usually left in."